burst of flavor, heart-healthy grapes are great on their own or as the star ingredient in these championship recipes. Go with grapes every day for a whole bunch of healthy! ¡Llena tu hielera con uvas de California y prepárate para el partido! Las uvas son increíblemente versátiles y son una excelente opción como un snack saludable para el dia del partido. Con su sabor fresco, y además buenas para el corazón, las uvas son excelente solas o como ingrediente estrella en estas recetas ganadoras. Sea una ensalada, en brochetas, en sándwich, o en salsa, Partidos Deliciosos tiene la receta perfecta para cualquler fanático hambriento. Estas recetas harán que anotes un “gol” el día del partido. ¡Come uvas todos los días para un montón de salud! 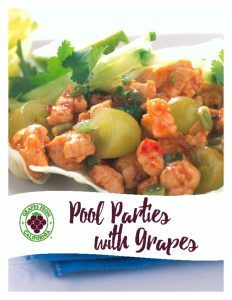 Go with grapes to make a splash at pool parties throughout the summer. Fun in the sun calls for snacks that are crowd-friendly, cool, and refreshing – like California grapes. Crisp, juicy, and colorful too, grapes are a perfect pick for poolside snacking. 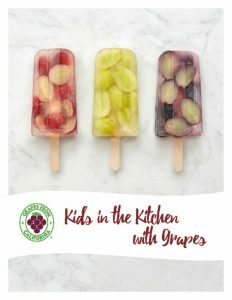 Serve them on their own or dive into Pool Parties with Grapes – a collection of tasty, people-pleasing recipes that will fill you up without weighing you down. Utiliza las uvas para hacer un chapuzón este verano. Las botanas ideales para la diversión bajo el sol son refrescantes y sabrosas – tal como las uvas de California. Las uvas de California son frescas, jugosas y coloridas; son la mejor opción para disfrutar del verano. 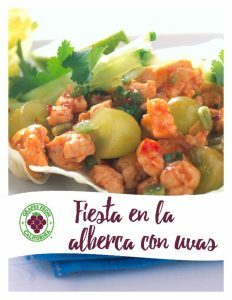 Las puedes servir solas o utilizar Fiesta en la alberca con uvas; una colección de recetas deliciosas que le encantarán a todos y te dejaran lleno sin sentirte pesado. Looking for the perfect picnic? Go with grapes in the basket! Plump, juicy, and always delicious, grapes are very good for you too! Enjoy them by the bunch or as the signature ingredient in tasty, wholesome dishes. Grapes go with everything! 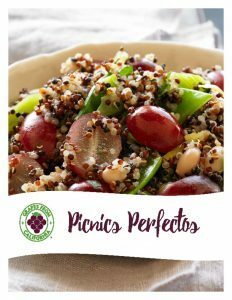 So pack the picnic basket with recipes that include grapes and get more from the meal: more taste, more color, more crunch, and more nutrition. Whether a salad, side, sandwich, or sip, Perfect Picnics brings together better-for-you California grape recipes that are perfectly portable for the next outdoor adventure. ¿Quieres disfrutar de un picnic perfecto? ¡Llena tu canasta de uvas! Ricas, jugosas y siempre deliciosas, las uvas también son muy buenas para tu salud. Disfruta de ellas directamente de su racimo o utilízalas como ingrediente distintivo en platos saludables. ¡Las uvas van con todo! 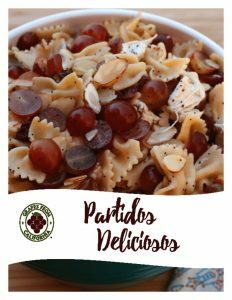 Añade a tu canasta recetas que incluyen uvas y obtén mucho más de tus comidas: más sabor, más color, y más nutrición. Ya sea una ensalada, un entrante, un sándwich o una bebida, Picnics Perfectos ha reunido recetas de uvas de California que puedes preparar fácilmente y llevarte en tu próxima aventura al aire libre. Descarga hacienda clic en el botón verde de abajo. Fresh grapes have been enjoyed for thousands of years. 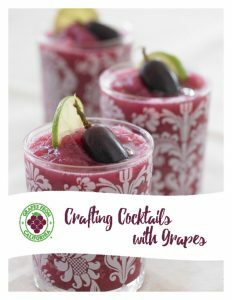 Their fresh burst of avor, bite-size portability and versatility in meal creation have made grapes one of the world’s most popular foods. Surprising to some, grapes are also an incredible addition to baked recipes, unleashing their depth of flavor and lending their color and beauty to a variety of baked dishes, from breads to desserts. 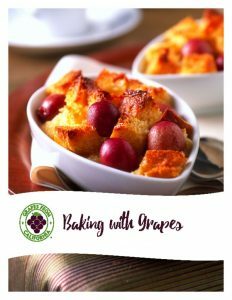 Baking with Grapes is an assortment of recipes featuring grapes in a variety of baked dishes that will either start or end your day with flavor. to glasses spiked with vodka, gin, tequila or rum. Bursting with sweet and juicy flavor with every bite, grapes are a kid’s favorite fruit! What’s more, in addition to their great taste, grapes are healthy too. But the best part? Grapes are fun! 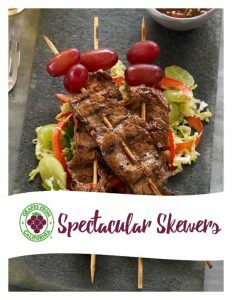 Spectacular Skewers is a collection of our favorite California grape skewer recipes. As an appetizer, entrée or dessert, there are skewers fit for every course. With delicate sweetness and a refreshing crisp texture, California grapes complement a wide variety of ingredients and dressings. 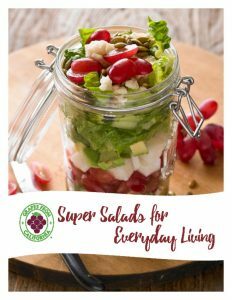 For superb salads, adding grapes is a brilliant choice! 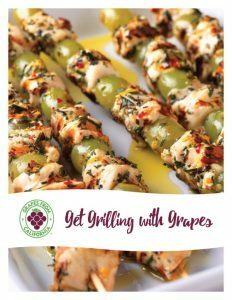 Get Grilling with Grapes is a collection of recipes from the California Table Grape Commission that showcases grapes in a variety of grilling applications. Nothing brings out flavor quite like grilling, so let’s get started!